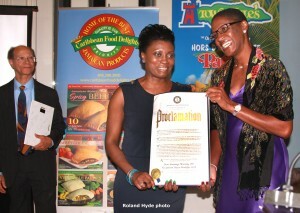 Brooklyn Borough Hall was awash in the colors, spirit and energy of the Caribbean on Tuesday, April 16, as the community turned out in droves to celebrate Olympian, Deon Hemmings-McCatty, OD, Diaspora honorees and Caribbean athletes at the Team Jamaica Bickle (TJB) Awards Reception at Brooklyn Borough Hall. The event also serving as a pep rally leading into the Penn Relays, (next week), April 25-27. Hemmings-McCatty, has the enviable distinction of being the first Jamaican and English-speaking Caribbean woman, to win an individual Olympic gold medal at the 1996 Games in Atlanta, Georgia, setting a new world record (52.64), which stood until 2004. While the evening focused on honoring the services of the honorees, the fundraising aspect was also heavily reinforced. This, as TJB is fully reliant on donations and sponsorships to fund its programs. Master of Ceremonies for the evening, Aubrey Campbell, was tasked with reminding folks as the evening progressed, to fill in and return their pledge forms. In his opening remarks, CEO of TJB reminded the audience of the organization’s mission in ensuring that amenities provided through its ‘Hospitality Initiative,’ are fully implemented during the Penn Relays. The athletes benefit from meals and other refreshments, physical therapy/chiropractic care, and ground transportation. The organization also handles the bookings and negotiation of [reduced] hotel rates, for the very large contingent. The mood was set for the evening, with the showing of special races from this year’s high school boys and girls championships in Jamaica; the record setting run by Jheevaughn Matherson, boys class 3, 100m winner; the girls class 3, 100m winner, Kimone Shaw; Michael Cedenio, (Trinidad & Tobago) winner, Carifta U20 Boys 400m final; and the highlight of the evening, the 1996 Olympic win by the evening’s honoree, Deon Hemmings-McCatty, reminding the audience why TJB is committed to serving our athletes and ambassadors. While TJB’s role at the relays centers on support services, the organization is particularly proud of its ongoing commitment to sports development through its annual contributions to the G.C. Foster College of Sports in Jamaica. “We feel that if we can, even in a small way contribute to the enhancement of training, facilities, personnel and programs, then what we do on this end, really does count,” said Irwine Clare, the organization’s CEO. The usual spirit of cooperation between competing brands Caribbean Food Delights and Tower Isle’s Patties, was once again clearly demonstrated. Hosts of the evening’s reception, Tower Isle’s welcomed the HoSang’s to (its hometown) Brooklyn, and introduced, CEO Vincent HoSang, to bring his remarks for the evening. Mr. HoSang emphasized the importance of working in concert for the benefit of the athletes and recognized Robert DeSouza, (Transcontinental Shippers) and Dennis Hawthorne (Dennis Shipping) as examples of the same spirit of collaboration on the athletes’ behalf. The evening however belonged to Hemmings-McCatty, who was received warmly by the large crowd, as she accepted proclamations from the offices of Congresswoman’s Yvette Clarke and Marty Markowitz, Brookyn Borough President and a citation from the office of congressman Gregory Meeks. She was also presented with a TJB award and a community service award from Tower Isle’s Patties, named in honor of its founder, Beryl Levi, now deceased. Community service and advocacy awards were presented to Diaspora leaders, Colette Cyrus-Burnett, CEO of Superwings; G.S. O’Brien Simmons, founder of (the Diaspora based), Bequia United Progressive Organization (BUPO) of St. Vincent and the Grenadines and Derrick James, Consul General of Grenada. Herman LaMont, Consul General of Jamaica to New York, brought greetings on behalf of the Government of Jamaica and the consular corp., of which Jamaica is chair. Consul Generals present were, Julian Du Bois, St. Lucia; Lennox Price, Barbados; Omyma David, Antigua & Barbuda, and (honoree), Derrick James, Consul General of Grenada. A host of other public officials and dignitaries were present in support of the organization: Sophia Jones, representing the Brooklyn Borough President’s office; Honorable Sylvia Ash, Supreme Court Judge; Ray Thomas (Nassau County Executive); Verna Arthur, Club St. Vincent; Dahved Levy, radio announcer, (107.5FM WBLS) and co-master of ceremony; Cory Provost, Leader, District 58 Assembly District; Brian Cunningham, office of Senator Kevin Parker and Odain Cordiffe, office of Councilmember Jumaane Williams. TJB, always appreciative, thanks its sponsors; Western Union, Union of Jamaica Alumni Association, Caribbean Food Delights/Vincent HoSang Family Foundation, Tower Isle’s, Fly Jamaica, Grace Foods, USA, GraceKennedy Remittance Services, LIME, Lomax Foundation, The Door Restaurant, Union of Jamaica Alumni Associations, Transcontinental Shippers, and the Jamaica Tourist Board; its supporters, islandvoice.org, RTN Production, Super Wings, Total Caribbean Network HD, and Caribbean Link Distributors. You are doing good job. thanks. Hope my little donation can help. Hope my donation can help. More donation for Team Jamaica Bickle. Great job, keep going. Great cause! Hope you guys have a quality pair of running shoes. Small donation but hope it helps. You are doing wonderful job here. Thanks from FL. very small amount but hope this help! Keep it up guys. Good Job. Keep Doing Good For Mankind. God Bless You. we at solderingexpert.com are glad to help this great cause!